It's no big secret that Pinterest can explode your blog traffic. And there's a reason that starting my profile was one of the first things I did when I started this blog. But the thing about Pinterest is that it's not like other social media sites. It's not all intuitive, and it takes a lot of strategy to get that sought after blog traffic. You really need to learn how to use Pinterest. 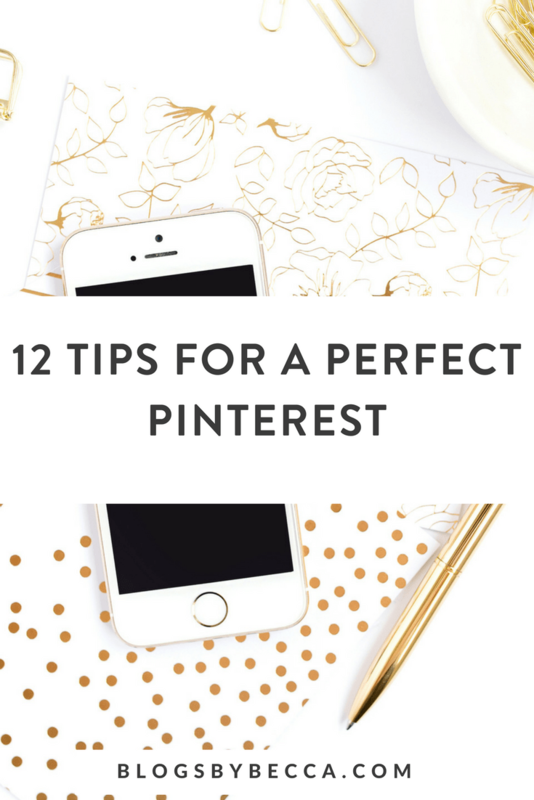 Here are twelve tips for the perfect Pinterest strategy to boost your blog and your biz. Want the full guide? Click here to get it! Note: This post contains affiliate links, which means that if you click a link and make a purchase, I may recieve a small commission. There is no extra cost to you for this. Not everything you pin can be on brand, obviously. But your board covers can. Any board cover can be changed. Most people (including me) just find an on-brand pin that's in their board and use a section of that. But if you want to be really fancy, you can actually make your own board covers. Here's how. Go to Canva (or Photoshop) and create a template that's 217 px x 147 px. That's the precise right size for Pinterest. Create a graphically pleasing, on-brand board cover. Then, pin that image to your board and just make it your cover like normal. Now, I haven't done this, not going to lie. But if you wanted to have the prettiest profile on the block, you totally could. It's ok if you want to have a couple “inspiration” boards that are sort of on topic. Like I have a “brand inspiration” board and a “workplace” board, that aren't really on topic, but sort of are. But almost all of your boards should be directly on point. The right people are not going to follow you if they get a recipe one minute and a travel tip the next. You want people who care about your travel tips because those are the people that are going to care enough to click through, subscribe to newsletters, and buy your stuff. It's an important aspect of how to use Pinterest. Three. Create lots of boards on sub-topics. Four. Create one board dedicated only to your own content. You should have at least one board dedicated exclusively to your own content. If you have more than one distinct topic, maybe two boards. 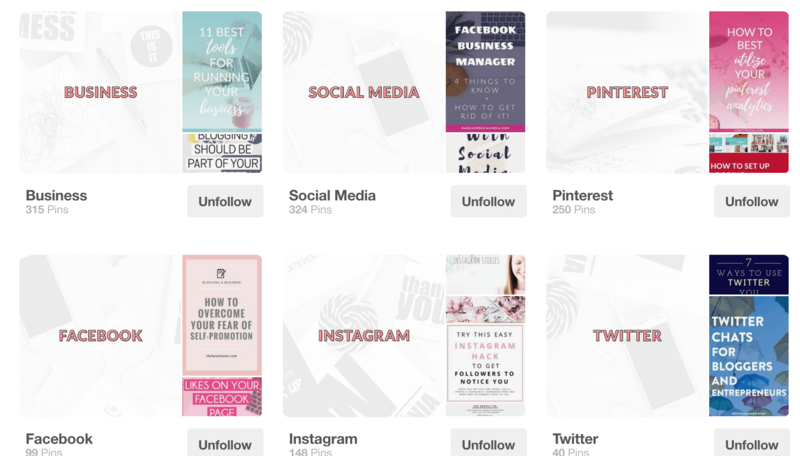 Your own pins should also be spread out throughout the rest of your boards (as relevant), but make sure you've got one board that is all your own content. And it should be the first board in your profile. This one's a biggie. You should absolutely be using either Tailwind or Board Booster to do your pinning (or use both). Tailwind and Board Booster are automated Pinterest tools. The short version is that you tell them what to pin, and they pin them at specified times throughout the day/week/month. So you can sit down for an hour, pin 200 things, and then have that spread out over the next week (or whatever). They also have good analytics, which we'll talk about in a minute. 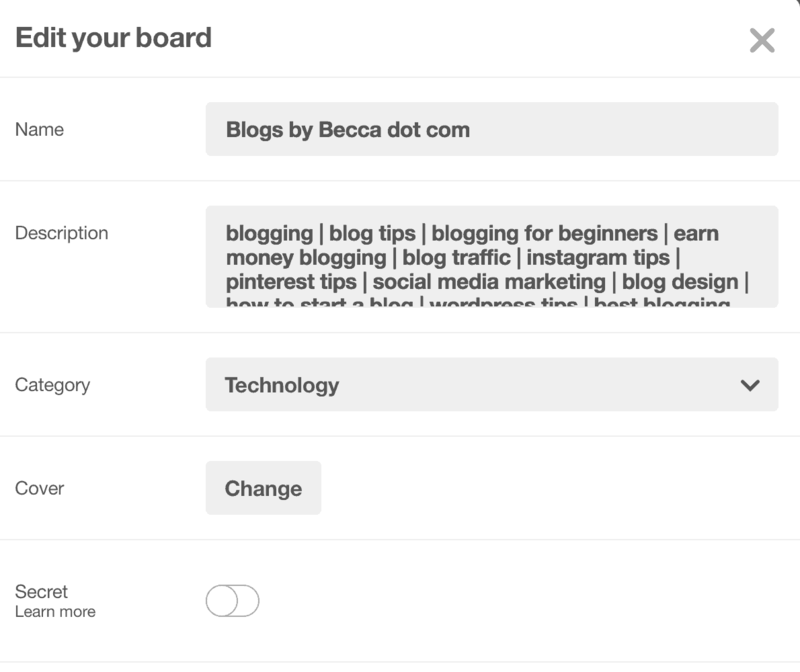 BoardBooster also has a neat tool called “Looping,” which basically means that it recycles the pins on your boards repeatedly so that your content is getting repinned over and over. It also cleans your board periodically so that you don't have 16 versions of the same post. Six. Make sure every post has a pinable image. Every single one of your posts should have an image that is intended to be a pin. Do not just pin your regular pictures, you need a pin that is the right size and that has the right look. If you use Canva, it will automatically create a template that is the exact right size for you, so you don't even need to figure it out. I use Canva for almost all of my graphics, and it's super easy. You should have a couple pretty colors, one, maybe two fonts, and everything should be clear and easy to read. Your pin should be tall, not square, to make it easier to read. Just browse Pinterest to get some inspiration. Seven. Make sure your descriptions are keyword rich. You need to have keyword heavy descriptions on your boards AND your pins. Pinterest is a search engine, that's how people find your stuff. Most keywords are pretty obvious, but if you need help, just look at what's coming up in your smart feed and getting a lot of repins, or run a search and see what kinds of other keywords Pinterest suggests. It's rarely something random. Eight. Use the “alt text” description on your post images. When you insert an image into a blog post on WordPress you always have the option to give it an “alt text” description. Do this. The alt description will become the pin description when someone else pins your image (or when you do). You can change this, but most people won't bother. And you want every pin to have a keyword rich description, as we just talked about. This is how you can control other people's pins. Pinterest has a feature called “rich pins.” It means that whenever something gets pinned from your website, a bunch of metadata gets pinned too, including your site name and link. This makes it easier to identify your pin with your site and will send more people back to your site. You absolutely want this. To get it, you first have to make sure that you are signed up for a business account, rather than a personal account. This takes like 3 seconds and is free, so no worries. You then have to insert some code into your site and then validate it with a Pinterest tool. It's a little techy, but it's actually not hard. Use a plugin to insert the code into your site if you don't know how. Group boards are where more than one person pins to the same board. And some of them have literally tens of thousands of followers and hundreds of collaborators. It's a fantastic way to get your pins in front of 10, 20, 30,000 new people. To join a group board, you have to (a) find them and (b) ask. To find them, either check out some of your favorite bloggers and see which group boards they're pinning to, or use Pin Groupie. Pin Groupie lists every single group board and has a bunch of info on how many followers, contributors, and repins it has. It's an insane tool. Use it well. Twelve. Start your own group board. Groups are awesome, so why not start your own? Just create a board like normal, and then it will ask you if you want to add collaborators. Add whomever you'd like. Maybe find some like-minded people in a Facebook group. I have my own group board for blog and biz tips, you can check it out here. 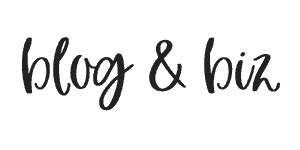 And if you have a similar blog and would like to contribute, email me at hello@blogsbybecca.com and let me know! So, there are twelve tips for success on Pinterest. Pinterest is not always the easiest, but it can be the best. Happy pinning. I’d like to be part of your “Blog + Biz Boosts” pinterest group. 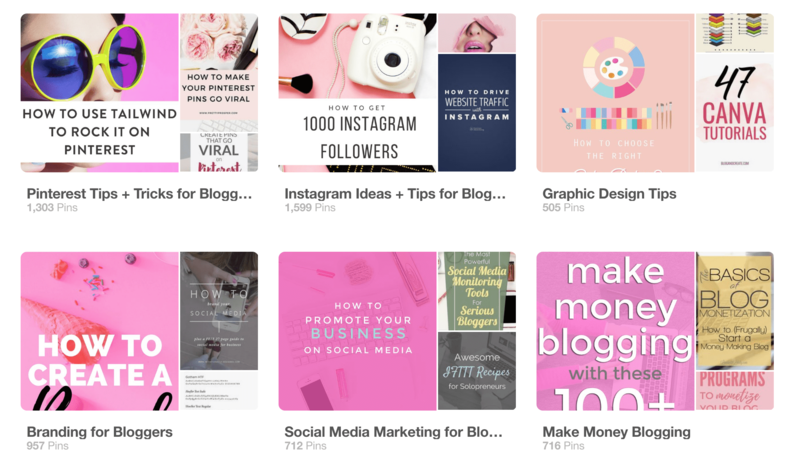 Great article im just learning Pinterest and this is super helpful graet advice .Will be using these methods for sure .Hope to get more traffic to my blog .